The NanoTest Vantage nanoindenter system is a universal platform for different methods to characterize the mechanical properties of surfaces and thin films. The modularity of the system allows both the combination of all the measurement modules and customizing the system to specific applications. The base frame made of high stiffness granite together with new, high-resolution electronics, provides even more precise measurements with highest load and displacement resolutions at lowest drift rates. High precision measurements can now be performed even faster than before. Two loading heads (alternatively or in combination) allow nano- and microhardness testing. The special pendulum design provides full modularity and excellent performance, both fully ISO 14577 and ASTM 2546 compliant. The nanoindenter NanoTest has the lowest drift rate of all instruments in the market, both at room and elevated temperature. This allows the application of a wide range of loading rates during the measurements. Besides the well known nanoindentation-technique, also other tests such as nano scratch and wear tests, nano-impact and fatigue for high strain rate testing as well as nano-fretting tests are available options and expand the accessible experiment window to simulate the contact mechanics in the final application. In addition, the variation of the environmental conditions is a key feature of this nanoindenter, which allows to perform tests under true service conditions. Micro Materials has been a leading manufacturer of high temperature nanoindenters and currently offers a temperature range from -100 °C up to 950 °C. Besides the temperature range, also tests in liquids, under controlled humidity and atmosphere as well as in vacuum are possible. Among the many environmental options, the high temperature capability is one of the most outstanding features of the nanoindenter NanoTest. Ranging from cold temperatures down to -100 °C up to high temperatures up to 950 °C, materials actually can be tested at their true service temperatures. This is especially crucial for the performance of coatings used in unlubricated cutting applications due to the frictional heat. The horizontal system configuration in combination with the independent sample and tip heating offers a drift-free design, which results in drift-levels and data quality at elevated temperatures that are not achievable by any other competitive nanoindenter on the market. A purge chamber allows to measure in a controlled argon/nitrogen atmosphere to minimize oxidation. However when temperatures above 750 °C are needed, the NanoTest Xtreme offers vacuum-compatible solution, which allows to push the borders of high temperatures to higher levels. Temperature options include independent tip and sample heating to ensure isothermal contact. Most of the measurement options are compatible with the environmental options. 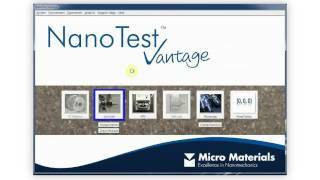 The nanoindenter NanoTest Vantage allows for fast, highly accurate nanoindentation experiments to obtain material properties such as nanohardness, modulus, creep and more. Typical applications which were reason for the invention of the systems 30 years ago is the measurement of mechanical properties of thin coatings. The new technology and the highly precise system design also allows for the analysis of multiphase-materials as well as probing the microstructure of materials. Due to the high lateral stiffness of both loading heads compared to other nanoindenters, the NanoTest allows for highly accurate scratch tests and reliable determination of coefficient of friction, even on very rough samples. The nano-fretting offers an additional tool to investigate for high cycle reciprocating sliding wear and fatigue. Using sliding amplitudes from the sub-micron to 20 µm at frequencies ranging up to 20 Hz (higher on request), both fretting as well as high-cycle sliding wear tests can be performed. Simultaneous friction measurement, various indenter-tip geometries and materials are available. Among the many environmental options, the high temperature capability is one of the most outstanding features of the nanoindenter NanoTest. Ranging from cold temperatures down to -100°C up to high temperatures up to 950 °C, materials actually can be tested at their true service temperatures. The horizontal system configuration in combination with the indenpendent sample and tip heating offers a drift-free design, which results in drift-levels and data quality at elevated temperatures that are not achievable by any other competitive nanoindenter on the market. A purge chamber allows to measure in a controlled argon/nitrogen atmosphere to minimize oxidation. However when temperatures above 750°C are needed, the NanoTest Xtreme offers a vacuum-compatible solution, which allows to push the borders of high temperatures to higher levels. "Different cast materials are investigated in the Nanotest Vantage equipment. We are doing mechanical investigation on Aluminium, Magnesium, Steel and Cast iron. The first publication was made on self-lubricating on flake graphite under wear conditions. The range of possibilities the equipment is offering was a factor when we bought the equipment. The different modules is a chance to upgrade the system in the future. The support and knowledge at LOT-QuantumDesign is good."